Color Scheme: Fern green, shades of white & gold. The inspiration for this shoot stems from the romantic French lace Yolan Cris' made his gowns out of. 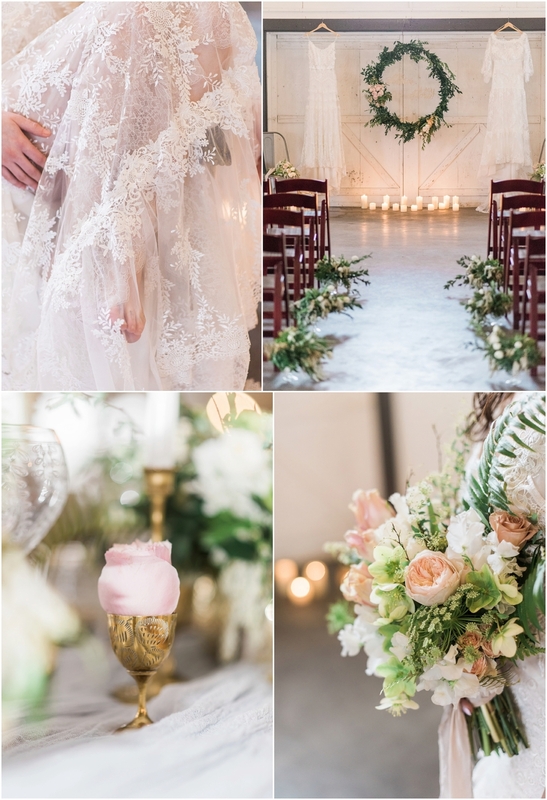 From there, we meandered down a springtime French countryside path - a bright, open venue, mostly white florals with hints of soft blush and peach, lots of lush foliage and ferns, a romantic, hand-calligraphed invitation suite, feminine, organic rings, and a tablescape full of romance and whimsy. As we collected pieces for this shoot, ferns became a repeating motif and appeared everywhere from the laser-cut napkins to the ring boxes, and from the brides' bouquets to cutouts on each plate. We also incorporated other French elements - multiple wine glasses, baguettes on the tables, and hand-painted macaroons for dessert alongside the almost naked cake. We loved the result and hope you will too!